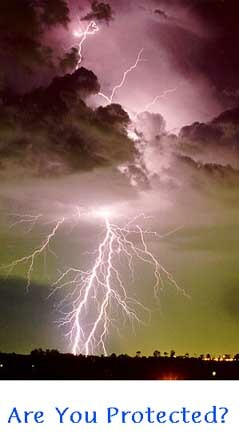 A bolt of lightning can be two miles long, travel at the speed of light, reach 50,000 degrees and carry 100,000,000 volts. Is Your Electrical System Protected? The immediate threat of damage to your electrical components and equipment by high voltage transients, spikes, and surges would be eliminated. Your transient voltage surge suppression equipment would also guard against long term deterioration effects of transient voltages on computer chips and printed circuits boards. • Protection against lightning induced transients voltages. • Reduction due to stress and failure from semiconductors. • Reduction of computer logic loss. • Reduction of microprocessor malfunction. • Extended light bulb life expectancy. • Reduction of equipment failure and down time. • Improved overall efficiency of the entire electrical system. • Protection against internally induced transient voltages. • Protection of computer chips in sensitive electronic equipment. • Reduction of computer data storage errors. • Reduction of insulation breakdown in motors. • Improved operating efficiency of air conditioning systems. • Reduction of maintenance costs for all electrical equipment. The purpose of a surge suppressor installed in your main electrical service is to prevent transient voltages that originate outside from entering into your whole system. Lightning that strikes either directly or close to your home or a remote utility line can cause this type of transient voltage. When neighboring plants or work areas start or stop large equipment (motors, presses etc.) voltage spikes can alsoâ€¨travel into your system. The purpose of a surge suppressor installed in your electric panel is to prevent transient voltages that originate inside the building from surging through interconnected circuits at your location. When large motors, relays, and other inductive devices are shut down the voltage that was flowing to them has nowhere to go and must be absorbed into the surrounding wires as well as into the other devices. Some transient volatages can reach as high as 2,500 volts. Although these voltages reach that magnitude in a fraction of a second the results can be very damaging. Imagine what that does to your computer or other valuable electronic equipment. Plug in protection "Outlet Strips"
These types of surge suppressors should have a response time of less than one nanosecond. They should also handle a peak surge of 39,000 amps total, and be rated for 480 joules. All of them should also bear the 1449 UL listing. The purpose of transient voltage protection installed at an individual piece of electronic equipment is to prevent even small transient voltages from falsely triggering semiconductors into conduction and thereby upsetting the data processing logic, timing, and sequencing. This type of protection for data processing equipment reduces maintenance costs and increases the life expectancy of the computer chips used in the equipment. What is Transient Voltage? What is a Spike? What is a Surge? Transients are brief over-voltages in an electrical system. A spike is an over-voltage that lasts from nanoseconds to milliseconds. A surge is an over-voltage that lasts from milliseconds to seconds. Transients can disrupt, damage, or completely destroy electronic equipment. The results can appear immediately or stretch over a long period of time.